The Game Believes in You: How technology can make learning more dangerous. Classroom technology can make learning more dangerous, and that’s a good thing. This piece was adapted from The Game Believes in You: How Digital Play Can Make Our Kids Smarter, out in April from Palgrave Macmillan. Steve Jobs once called the personal computer “a bicycle for our minds,” a tool that helps us go farther with the same amount of energy. But for many teachers, it has been a bumpy ride. Educators have long held new technology at arm’s length, and probably for good reason: For more than a century, they have looked on as reformers pushed a series of mostly ill-fated technical innovations, each touted as the Next Big Thing. 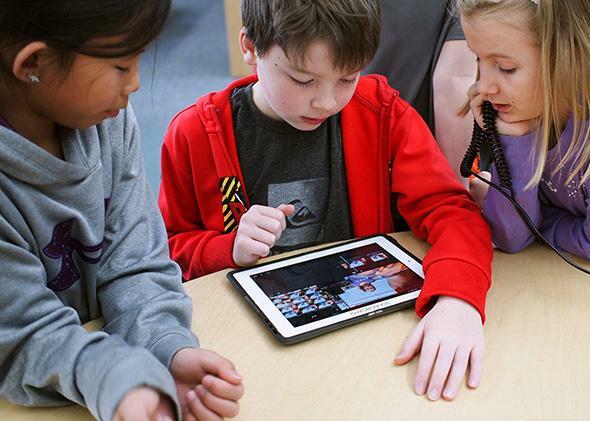 The latest movement to add more technology into classrooms is repeating the same mistakes, focusing on how tech can help teachers by churning out more data about students, saving time, and raising test scores. Here’s a crazy idea: What if we focused less on selling technology to teachers by convincing them it makes learning more efficient and more on how computers, like a bicycle, might make learning a little more dangerous? I’ve been working for the past few years on a book about games and learning, and I’ve begun to see that part of their appeal for teachers is how games persuade kids to take risks. In the 1950s and 1960s, the federal government and private foundations poured millions of dollars into instructional television, much of it produced locally on closed-circuit systems. “Studio teachers” taught classes of a hundred students or more. In the 1980s, schools began buying what were then called “microcomputers,” a shopping spree that continues today with laptop and one-to-one tablet programs. Stanford scholar Larry Cuban, perhaps our foremost expert on how teachers actually work, has said teachers are skeptical of technology because, at heart, they’re deeply practical people who want tools that solve problems they see as important. Reformers who want to make teaching more “planned, systematic, and engineered” will always be disappointed, he said. But what if technology took teaching in another direction, with risk-taking—and a touch of subversion—at its center? Good teaching is not about playing it safe. It’s about getting kids to ask questions, argue a point, confront failure and try again. More teachers might be willing to embrace technology if they saw it as a way to inject more of the dangers of learning into their classrooms. When I met game designers David Langendoen and Spencer Grey in their tiny studio in New York’s Flatiron District, they were immersed in the minutiae of a free-to-play series of computer games called Mission US that invites kids to learn about American history by role-playing as teenagers living through key historical periods. The game’s first chapter, For Crown or Colony?, featured a young boy in Revolutionary-era Boston who must choose sides in the conflict. The second game and, at the time, the series’ most popular, Flight to Freedom, featured a young female slave named Lucy who lives on a Kentucky plantation in 1848. In the course of the game, she must decide whether to stay a slave or escape to Ohio. As we sat down to talk one afternoon, Langendoen searched the screen of a computer on a conference table and found the tiny digital counter near the bottom. He pointed at the number: Watch it, he said. Every time it changes, another student, playing as Lucy, has escaped to freedom. The screen showed real-time player data, and as we talked, the digital counter read 22,850. Because Mission US is Web-based, the creators can track every escape attempt and see which ones are successful. About one in four ends well, Langendoen said, but the odds improve with each try. “We wanted the player to experience failure, but in a controlled manner,” said Grey. At the time, he and Langendoen were hip deep in research for the next chapter, which dropped students into a Northern Cheyenne settlement in 1866. The designers insisted that all the Indian roles be voiced by native Cheyenne voice actors—it seemed a good idea at the time, Langendoen said, but there are only a few thousand Cheyenne left on earth and it was a safe bet, he joked, that few of them are trained voice actors who live in New York City. As we talked over the next few minutes, the counter slowly crept up: 22,851, 22,852 … each click a player, likely a school kid, sitting in a classroom and playing as Lucy. What surprised the game’s creators was how many kids, given the choice, chose to stay in Kentucky and remain, in Langendoen’s words, “good slaves” while in school. “When they’re playing games at home they’ll screw up all over the place,” he said. “Most kids, when they’re in the environment of school, feel like they need to behave and do the right thing.” Sitting in school, they understand that obedience, not defiance, is what’s expected, he said. “It takes the teacher, actually, nudging them toward resistance. Like, ‘Try it.’ It surprised the hell out of us,” he said. This column was adapted from The Game Believes in You: How Digital Play Can Make Our Kids Smarter for The Hechinger Report, a nonprofit, independent news website focused on inequality and innovation in education.